Dr. Smith's ECG Blog: A Pathognomonic ECG. What is it? The Cr was 12.1 indicating (new onset) of renal failure. Calcium was given without much change. The next AM the non-ionized Ca was 5.7 mg/dL (normal: 8.6-12.0). QTc 523. Long ST segment remains. Although the QT is very long, long QT due to hypocalcemia is rarely associated with Torsades de Pointes. There are a number of ECG patterns that should immediately suggest a clinical diagnosis. This is one of them! The value of recognizing this particular ECG pattern — is that it may expedite your clinical diagnosis even before laboratory results return. Figure-1: The initial ECG in this case — and a rapid method for estimating the QTc (See text). COMMENT: I wanted to discuss a number of interesting aspects regarding the ECG in Figure-1. As per Dr. Smith — our attention is immediately captured by the very long QTc interval in ECG #1. Measurement of intervals is one of the tasks that the computerized ECG interpretation is usually very accurate with. 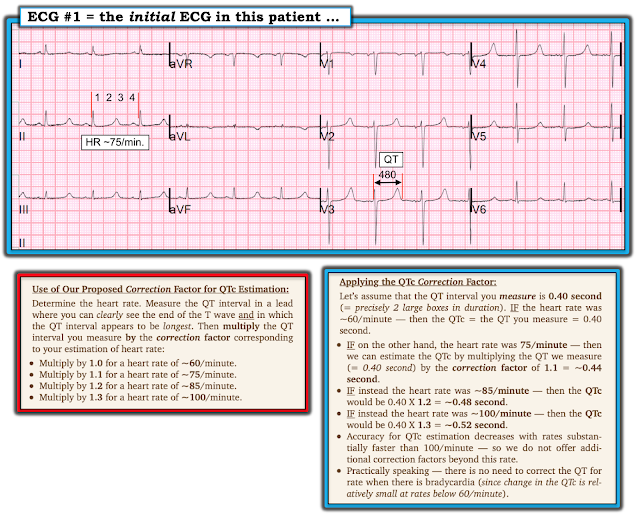 The computer calculated a QTc = 525 ms for the ECG #1. I like the “eyeball method” to tell at a glance if the QTc is likely to be prolonged. Assuming the heart rate is not too rapid (this method works less well with heart rates >90-100/minute) — one may suspect that the QTc will be long if the longest QT interval that you can clearly see on the tracing is more than half the R-R interval. To quickly estimate a numerical value for the QTc — I developed a Correction Factor that has been surprisingly accurate for me in assessing too-numerous-to-count QTc values that I’ve estimated over the past 3+ decades. As per the text under the ECG in Figure-1 — you only need to remember 3 values (ie, 1.1 for a rate ~75/min; 1.2 for ~85/min; and 1.3 for ~100/minute). With a little practice using this method — you can estimate the QTc within seconds. Applying my method to the case at hand — the rhythm in ECG #1 is regular, with an R-R interval just under 4 large boxes. Thus, the heart rate is just a bit over 75/minute (ie, 300÷4). I selected lead V3 as one of the leads where we can clearly define the onset and offset of the QT interval. I measure the QT in this lead to be ~2.4 large boxes = 480 msec. Using a correction factor of 1.1 (since the heart rate ~75/minute) — I estimate the QTc = 480 + [480 X .1 = 48) = 480 + 48 ~528 msec. For speed and ease of calculation — I usually round off values (it’s all an estimate anyway! ) — but I’ve enjoyed being able to get very close to computer-calculated QTc values by this simple correction factor method. When the QTc is Prolonged: Assuming there is no bundle branch block, ischemia or infarction — I suggest remembering the following short LIST whenever you recognize QTc Prolongation. Think of: i) Drugs (many drugs prolong the QT interval — and combinations of drugs may result in marked prolongation); ii) “Lytes” (ie, Think of low K+ — low Mg++ — and/or — low Ca++); and, iii) a CNS Catastrophe (ie, stroke, bleed, coma, seizure, trauma, brain tumor). Clinical correlation will typically suggest which one or more of these 3 causes of a prolonged QTc is operative for the case at hand. The patient in the case presented here had new-onset renal failure — so, assuming normal mentation and no potentially QT-altering drugs — electrolyte disturbance should be strongly suspected. ECG Findings of HypoCalcemia: Hypocalcemia generally prolongs the QT interval. It is therefore one of the entities on our short LIST to immediately think of whenever you recognize QT prolongation. PEARL #1: In theory — pure hypocalcemia does not affect the T wave! As a result — the characteristic ECG picture of hypocalcemia is that of a flat and prolonged ST segment, at the end of which occurs a surprisingly normal-looking T wave. PEARL #2: Hypocalcemia and hyperkalemia may occur together in patients with renal failure. Clinically — this combined electrolyte disorder may occasionally be suspected by the ECG finding of peaked T waves with narrow base that occur at the end of a long and flat ST segment that produces a prolonged QT interval. Final THOUGHT: We were not told what the serum K+ value was in this case. Given the very long QT interval in ECG #1 + the remarkably flat ST segment in most leads + the peaked and relatively narrow base for many T waves that look taller-than-they-should-be in leads II, III, aVF, and V2-V4 — I suspect combined Hypocalcemia and Hyperkalemia in this case. It is believed that the reason why long QT interval due to hypocalcwmia is not predisposed to torsades de pointes is because the QT is prolonged homogeneously in the LV in hypocalcemia while, in long QT syndrome, the QT is prolonged inhomogeneously in the LV causing potential gradient from one area of LV to the next, setting up for torsades de pointes. Why is this prolonged qt(or qu interval) not suggestive of Hypokalemia ? Because it is a long flat ST segment. HypoK does not have such a flat ST segment. Search for hypokalemia on this blog to see many examples. In hypokalemia it's actually a prominent U wave resulting in a long QTU, not long QT. The prominent U wave may not be obvious in some leads while it is in other leads like in inferior leads. Your Pearl #1 has me a bit confused: "PEARL #1: In theory — pure hypocalcemia does not affect the ST segment!" Did you mean "T wave?" In hypo or hypercalcemia, don't think in terms of a long or short QT but in terms of normal T wave being pushed out from a long ST segment (of course the QT will end up long) or pulled in with a short ST segment. In long QT syndrome, the T wave starts right-a-way after the QRS with hardly any ST segment. If that T wave is "tented", add hyperkalemia as Dr. Ken Grauer did above. Thank you for your insight Dr. Wang. However, I don't think my query has yet been answered, although I DO understand - and accept - what you are saying. It's the "pushing out" and "pulling in" that is at issue here. Since this case is about hypocalcemia, let's limit our discussion to that. Ken's Pearl #1 asserts that hypocalcemia ALONE has NO EFFECT on the ST segment. That is simply not true. You yourself mention "a long ST segment" and "a short ST segment." Is this change in the duration of the ST segment not affected at all by the external Ca++ level and is it strictly due to decreases in Ik or Ip conductances? Or, does the [Ca++]o actually play a role in the duration of the ST segment? I think Ken's Pearl #1 would be spot on if "T wave" were substituted for "ST segment." I am certainly in complete agreement with you both that the T wave in hypocalcemia is NORMAL. The L-type Ca++ channels shut down in the early part of Phase 3 and add little (if any) to the T wave. But pure hypocalcemia alone would lengthen the ST segment because it isn't the EXTRACELLULAR Ca++ level that turns off the L-type Ca++ channels but the INTRACELLULAR Ca++ level. With hypocalcemia it takes longer to reach that intracellular threshold concentration - thus the prolonged Phase 2 (ST segment). Naturally-occurring deviations of the Ca++ level (hypo- or hypercalcemia) have no direct effect on the delayed K+ rectifier (Ik) current nor the inwardly rectifying K+ current (Ik1). So I maintain that hypocalcemia CAN and DOES affect the ST segment; BUT - in agreement with both of you - it presents with a prolonged (but otherwise unremarkable) ST segment terminated by a very NORMAL-appearing T wave. Dr. Wang - I've seen just about all your internet video postings and I've read your book "Atlas of Electrocardiography" (which I highly recommend). I have learned much from you. I'm still working my way through Ken Grauer's writings (he has been really prolific!) and am continuing to learn from him as well. Please accept my queries and observations in the spirit of learning and academia.